Adrenalin Pure – Three weeks of craze! The past three weeks have been maybe the most demanding in my life so far, at least in regards of concertising (not talking about emotional private stuff which I won’t mention since I’d be hit on the head by too many people about being too open and I would have to justify it with the lack of privacy-filter and apologizeâ€¦). After playing a week of Bachsuites at unusual venues as described in my last blog while practising the highly intense and demanding Pintscher Celloconcerto (Reflection on Narcissus), I travelled to Cleveland on the 2nd of November to play the Pintscher (by heart, couldn’t do it any other way as I like the feeling of authority to know the piece inside out) with this most amazing Cleveland Orchestra. Right after I had two days in Berlin to get the Chin Concerto back into my hands which I had to play in The Hague and Amsterdam, and now I am coming back from a week of Barber-Concerto in Sao Paulo and Belo Horizonte. I find it rather fascinating how humans cope with stressfull situations: some might collapse under pressure, but most people rise to the occasion, will find out that they need much less sleep than they thought and that they are much more efficient and productive when being faced with challenges. My sleep average dropped from about 7 hours to 4 (well, this also has to do with the mentioned above emotional stuffâ€¦. :)) and I had plenty of left-over time to continue for example playing Bach at unconventional venues: the orchestra in Cleveland had jumped on my idea and created a new concert series “Off Stage” which I “opened” at Dave’s Market, playing Suites No. 1, 5 and 6 in front of a extremely well listening audience in the produce section – normal shoppers mixed with classical music lovers who had heard the news of a Bach-Concert at that specific supermarket on the radio. I was impressed that inspite of the constant humming of the refrigerating machines there was something like a concert atmosphere, and even though I didn’t play every single repeat, I did play these three suites en bloc with not much talk in between the same way I would perform it on any major stage – playing for almost one hour just a bit louder than I would normal play (to overcome the fridge-humming). After playing for the new-born baby a week before at the maternity ward in Hamburg where I had to try to express everything within the piano-pianissimo range in order not to wake the baby, here I had to play everything above a healthy mezzo-piano or rather mezzo-forte. Yes, I was rather exhausted after that hour. It was the fifth time I played the Pintscher Concerto, and definitely the best – the orchestra gave all it had, the duo in the fourth movement with the phantastic principal cellist Marc Kosower (I LOVED his solo in Ma Mere L’Oye in the second half) was memorable, and Matthias Pintscher, who again conducted his own piece, is becoming a better conductor each time. For the first time we had as few balanace problems with that huge piece as ever before – reading all the millions of notes tends to make an orchestra play a bit louder than what is good for a poor solo cello, but in their case they kept the “panic-dynamic” to a minimum with the effect that all the difficult passages I had to play became audible. Oh, ohâ€¦ Talking about panic: some of the difficult passages in which I used to panic suddenly seemed feasable and I kept my nerves in check – really fulfilling performance, at least for me. Luckily enough I was invited to a small orchestra party in the house of the prinicpal flutist and her Venezuelan cellist husband whom I knew from years before, and while watching the couple dance in their living room it suddenly became clear to me that my inability to dance had something to do with my lack of success in relationships. Watching Daniel, the cellist, lead his wife Marisela effortless with a gentle smile, not pushing but giving her the feeling of being cared for, showed me my short-comings. Immediately, the next morning, I wrote an e-mail to the orchestra in Brazil to organize a dance teacher for me while being there for a week – I finally wanted ot start to learn how to dance, how to feel comfortable on a dance floor, how to lead, how to move and not be completely self-conscious. And I did it! In my free-time between rehearsals and concerts I had my own private dance-teacher in Sao Paulo, and as partner the lovely harp player of the orchestra I was performing the Barber with volunteered gracefully, her being a real dancer I got a double-lesson from two professionals. Oh, I should have written another blog in between, I know, because I am missing out completely my third experience with the Chin Concerto in The Hague and Amsterdam. The concert in Amsterdam was part of the Cello Biennale where I also had to play on a Tuesday morning at 9h30 Bachsuite No.6 in front of a bunch of wonderful cellists, not really the easiest of all tasksâ€¦ 🙂 For the first time though I enjoyed my experience at a cello festival tremendously, being much less scared of my colleagues than ever before which might have to do with the fact that I have matured into an old cellist now who has sooo many worries at hand that there is no space for worries about what other cellists might think about him. It also might have to do with the guy who founded and runs this Biennale, Maarten (forgot his last name, I am hopeless! ), cellist himself with such warm charisma that it is difficult to deny him anything; the secret to the success of that festival! I listened to some wonderful concerts there, gave a pretty disappointing masterclass (I wasn’t at my best in trying to bring out the best in the student, felt sorry for not having too many smart things to say within a rather short time-frame) and played the Chin after a first performance in The Hague at the final concert of that cello festival, and unless everybody was lying to me the cellists seemed to have liked that piece very much. 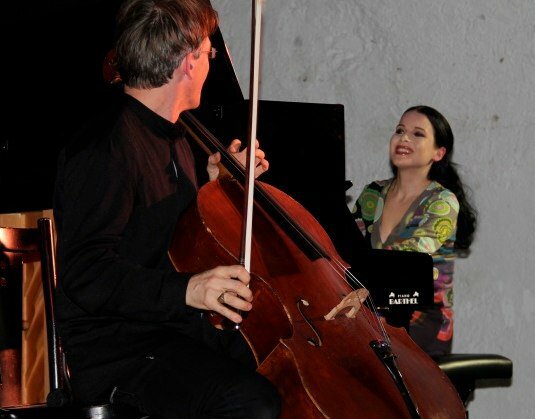 I was extremely nervous before this performance because my ambition was not only to make other cellists believe in this work but also to overcome my bars of shame from last year’s world premier when I got lost in two different places – nobody could tell, not even the composer, but I don’t care, I want to get everything always right! I was aiming for a perfect performance especially since it was being live broadcast. Unfortunately this time I missed the very tricky and most beautiful harmonic-passage in the third movement, just because the first three harmonics didn’t want to speak (high up on the C string) and subsequently I lost my nerves and with it the memory of what notes to play in which rhythm – so this time I improvised for about 15 seconds not very succesfully, but the rest of it went very well. But no, I haven’t forgiven myself for it yet – still running behind playing a “perfect” perfomance of that masterpiece! Maybe in Boston or Cologne next year, when I have the chance to play it each time three times in a row. Forgot to say that the Residentie Orkest and Brabbyins did a wonderful job playing the Chin with me – it takes so much dedication to bring these fragile scores to life! Last stop of the three week craze was Sao Paulo and Belo Horizonte in Brazil, and you can not believe my surprise when I realized that the three-year-old orchestra I was playing with, the Orquestra Philharmonica de Minas Gerais, played on an absolute top level – never heard the Barber Concerto accompanied any better, and the Symphonic Dances by Rachmaninov were a joy to listen to and to play in (yes, couldn’t help myself joining them in two performances). It obviously has to do with the fact that this orchestra consists out of young and hungry musicians from all over the world, though the majority is Brazilian: a healthy mix of different temperaments which gave me the feeling of almost being in a Youth orchestra. And the hall in Sao Paulo is probably one of the best in the entire world; an old British trainstation, shoebox, high ceilings, still the old British Empire architecture is visible but changed by the intelligently positioned large light-wooden patches which not only change the optic but also the sound. Phantastic acoustics, for listening as well as playing. Least but not last they are led by a really wonderful conductor, not so well known in Europe yet, Fabio Mecchetti, great taste and hands, good musician, and most importantly, his orchestra really respects him. Thanks for posting your new blog! Have a good month on your “home” continent! Glad you missed the drug raids in Rio- they happened just after you left! Must have been your playing which stirred something up! Bye for now! I feel honoured for being in Palacio das Artes, Belo Horizonte, the day you were playing amazingly with the Philarmonica de Minas Gerais, 23/11. The performance brought tears to my eyes. 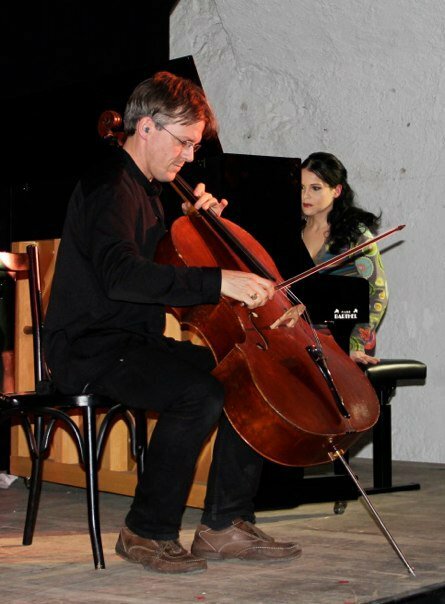 You’ve put so much emotion in your cello, I felt you would cry rivers while doing it! The orchestra was really amazing as well, and you should see their faces when you came back to play again after Barber’s “concerto for cello, op. 22”. Thank you very much for this unique opportunity. Having you with us at the FilarmÃ´nica was fabulous, do come back soon! Thanks for the blog, excellent as always. Try Salsa dancing, I couldn’t even waltz but with a bit of dedication I have become a descent salsero. I am now going to even try the Tango -oh God! Dancing is wonderful and teaches much about those personal relationship things that are hard to come by for us. Your performance of the Elgar Cello Suite, Op. 85, on Saturday, Dec. 5 in Kitchener, Ontario was simply amazing. I am still humming the melodies and thinking about your awesome, inspiring performance. Well done indeed. I hope you come back to Centre in the Square for another performance in the future. 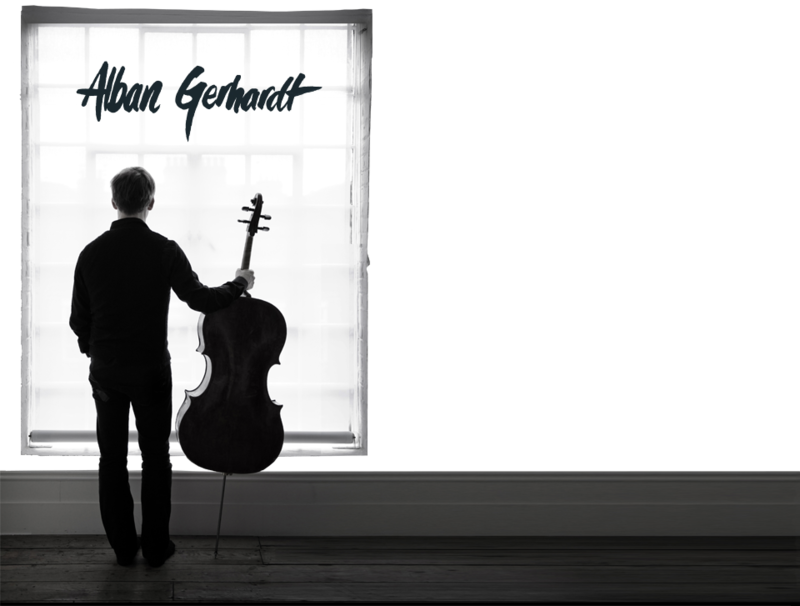 I have been a fan of yours since I saw you perform the Dvorak cello suite in September 2009 with the K-W Symphony. Another night of live music I will carry with me for a long, long time. Heard you last night in rehearsal with Fabio Machetti and the Jacksonville Symphony Orchestra. The response of the JSO to your Strauss was telling, they really appreciated your wonderful playing. Magnificent!! Will be in the audience Saturday for a wonderful concert.